I was hanging out having a cup of coffee the other day and sort of spontaneously broke out a few index cards and started to brainstorm some Christmas ideas. Even though I’m on hiatus, I still feel like I need to have some fresh Christmas material. That and I have a deadline Monday with Fast Lane Biker NY magazine for their December issue. Wish I’d been this far ahead of the curve for the Thunder Press issue, which has an earlier deadline due to its large distribution area and three editions. Anyway, I’ll post this on the site in a few weeks. 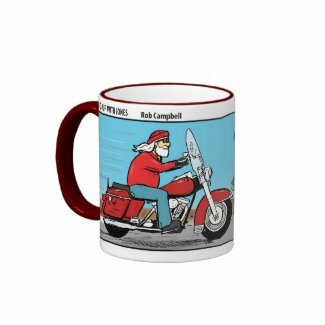 In the meantime, get it on a cup for your favorite biker at Christmas time! Available in a card soon.